I have always thought that one of the most universally loved types of toys are those for building. 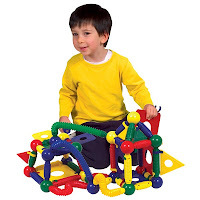 From simple blocks to pieces that connect to one another, I'm pretty sure I've never come across a child that doesn't get inspired to try to construct and build all of the structures that their imagination holds. However, the common issue that we seem to come across is finding items that work for multiple ages. Big Sister E gets bored with large, simple stacking blocks and Little Sister B is too young to understand Legos (or be trusted with them). So what's the happy medium? What toy is original, entertaining and can be enjoyed by a variety of ages? We now have to look no further than the amazingly fun Magneatos from Guidecraft. Wondering if my daughters would grasp the concept of Magneatos without any explanation, I opened up the brightly colored box and let them reach in. It took somewhere around half a second before their eyes lit up at just how easy it is to play with these unique magnetic pieces. "Look! They stick together this way! But then they don't stick on this side!" There's something almost magical about magnets, at least in this house. Little Sister B always gets a somewhat quizzical expression when they hold tight together and Big Sister E loves to hold them just close enough and watch them jump to one another. 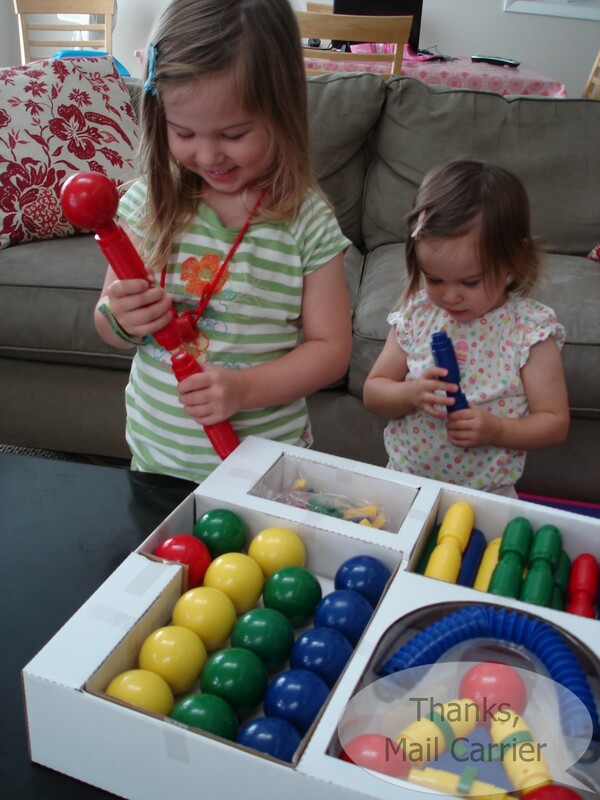 The mystery and excitement over the Magneatos balls and rods didn't end with just discovering their magnetic ability. Considering the only limitations to playing with the Magneatos Jumbo Master Builder Series 148 pcs set are your imagination and the distant thought of running out of pieces, it was time for the three of us to be creative. From simple to complex, constructing with our Magneatos was easy and fun. The large, plastic pieces were easy for small hands to grasp and the magnets were plenty strong enough to hold together as we built horizontally or vertically. Using the balls as connectors made it possible to create any angle and the varying length and flexibility of the rods just made innovation even more likely. There aren't any instructions or guidelines that come along with Magneatos, so Big Sister E and Little Sister B (and I) were able to really use our imagination to decide what to do next. 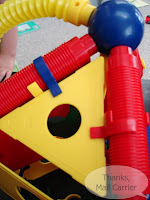 Even though Big Sister E needed a little extra help getting the Y-shaped connectors attached to the triangle, square or rectangle "sides," the challenge just increased the amount of time that she wanted to continue playing. I was really pleased with the overall quality of all of the Magneatos pieces and the way that the well-made, colorful items have a modern look but classic appeal. Each time that we have pulled them out has made for a different experience and Big Sister E has yet to show any signs of boredom. Designed for ages 2+, Little Sister B is still a little on the young side for the Magneatos, but she too has continually had a great time with them. Watching her examine and test out each one, I can easily see how much she is being stimulated and is learning new skills. Everything from colors to shapes to dexterity, as well as individual play or collaboration happens every time we open the box. And when it is time to put away the Magneatos, I'm thankful that they easily store back in the box without any problem. Whether playing alone or sharing in a group, the creativity, increased self-esteem and laughter that have come along with this magnetic building set has only added to our enjoyment and has reinforced what Guidecraft stands for: smart, well-crafted products which allow children's minds and imaginations room to truly wonder and grow. 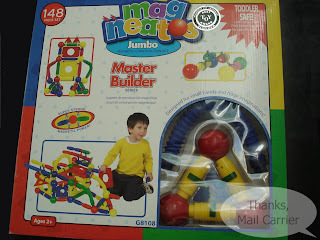 One lucky person will win a Magneatos Jumbo Master Builder Series 148 pcs set from Guidecraft! ARV $60! 3 Extra Entries if you blog about this giveaway linking back to Thanks, Mail Carrier and Guidecraft. Please leave an address where it can be found. A big thank you to Guidecraft for providing a Magneatos Jumbo Master Builder Series 148 pcs for review as well as a sunsuit for one lucky giveaway winner. The opinions shared are my own and honest and if you really need to see more, click here to see how I roll. My daughter would absolutely love these:) Since we are into blocks right now the rainbow blocks are something i def. love from them! 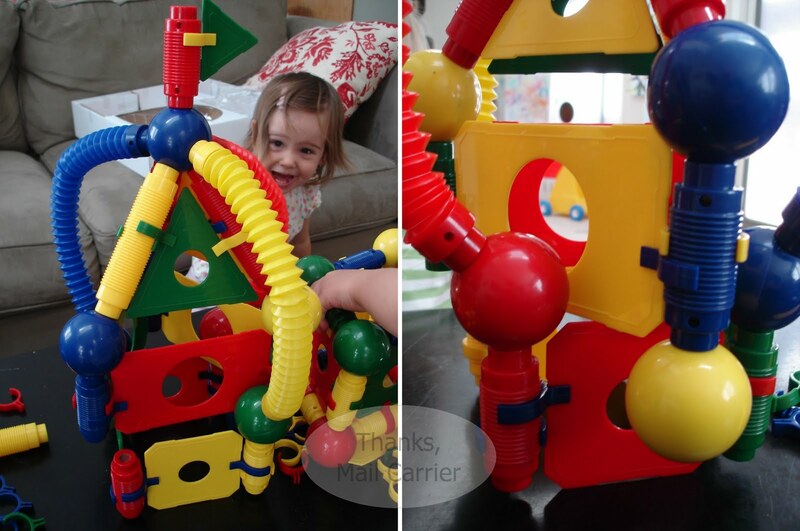 How amazing is that market play loft?! I would pick the 3 block shape sorter! My son loves shapes. I also love the See & Store Dress up Center! Subscribe to Guidecraft via Google Reader. Left message on Guidecraft FB Wall. Entered Baby Store Plus Giveaway. Their market loft is amazing! I follow Guidecraft on twitter (jenbutterfly). I subscribe via RSS to the Guidecraft blog. I follow via Google friend connect (jenbutterfly12), 2. I subscribe via RSS feed, 2. I like the Retro Racers Upholstered Rocker. I entered the BabyPop Cape and maske. giveaway. I entered the Baby Store Plus giveaway. I entered the Slix giveaway. I love the All in One Play Kitchen. The kids would play for hours with that! I entered the Cards Direct GC giveaway. I love the All in One Play Kitchen! I entered the Giftzip Amazon giveaway! I really like that art activity cart! I'm a new follower from Thursday Blog hop! The Sand Tray looks fun for the little one. I love the Doll Table and Chair Set - Espresso. I would love to have their kitchen helper. I love the Guidecraft All in One Play Kitchen I love the red and blue and how it's both modern and retro. I left the message on Guidecraft's Facebook Wall. I love their Train Toy Box!